ECDC has decided to replace the recycling credits it receives from CCC and has previously passed completely on to the 22 parish councils, schools, village halls and charities hosting recycling bank receptacles. They had been based on £38 per tonne. 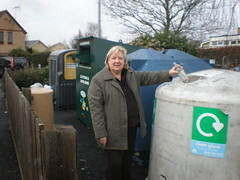 The proposal to pay a fixed rent of £60 per receptacle per year has been increased to £90 by the Officers, but this still leaves many of the charities with much less than before with no propsect of being able to increase their income by promoting better community involvement and recycling more. The following will be badly hit, receiving the following amounts compared with that received in 2009/10. The rest will receive slightly less, but the little-used ones will perversely receive more than before. All this assumes that in the rationalisation exercise, some won’t have receptacles taken away.